Of course you can export your caches for use in the field. Select a folder to export all caches in this folder, or select one or more caches in the cache list to export a selection. User information is also exported: Corrected coordinates will replace the original coordinates and notes are added to the beginning of the cache-description for paperless caching. Logs and additional waypoints can be included in the export. 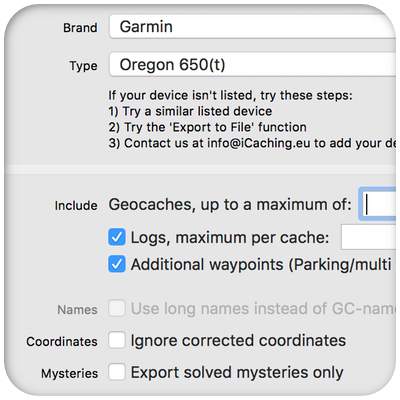 Most of the times you want geocaches on your GPS Device, so iCaching supports a long list of devices. All known Garmin handhelds like the GPSMap-series (including the new 62 series), Montana, Oregon, eTrex etc. And also a long list of Magellan devices and Delorme PN-series are supported. See the page with supported devices. iCaching will help you to select the correct settings for export to your device. And it will remember these settings for the next time you need them. You can also choose whether to include logs (and how much) and/or additional Waypoints. 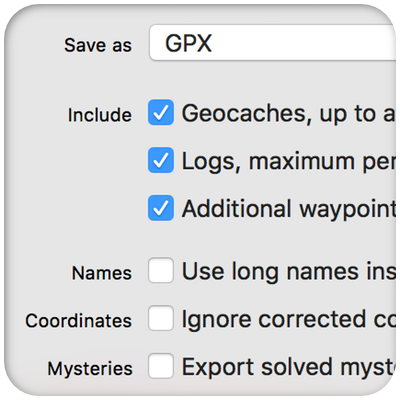 There is also an option to exclude unsolved mystery-caches from export. iCaching supports a wealth of file-formats. A little selection: GPX (eventually with GSAK or iCaching extensions), CSV, HTML, Garmin POI and so on…. 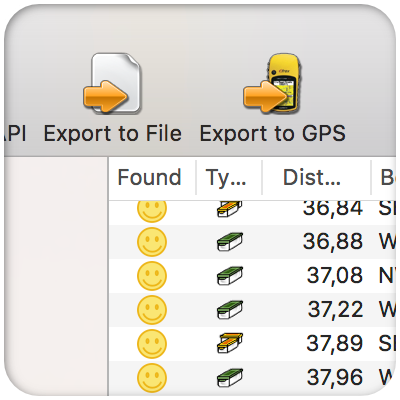 Export to different file formats is powered by gpsBabel.